In March 2018, a new version of the Capability Maturity Model Integration (CMMI) and appraisal method were released that can be used starting in 2019. This article summarizes the changes and upcoming milestones. The overall focus in V2.0 has been to drive home the point that the model is about improving organizational capability to improve performance for any type of project (Agile, Waterfall, or a hybrid). A simplified model that reduces redundancy. One model that includes Development, Services, Security, Supply Chain and People practices. Appropriate topics are selected for different types of organizations. Each Practice Area contains an evolutionary pathway (e.g., Level 1, 2 and 3 practices). Increase quality, reliability, and consistency. Reduce the overall lifecycle cost to conduct an appraisal. Minimize organizational and work effort disruption. Provide greater insight into performance improvement. Improve Business Performance: Business goals are tied to operations in order to drive measurable improved performance. Leverage Current Best Practices: CMMI V2.0 is a trusted source of proven best practices. Build Agile Resiliency and Scale: The model contains direct guidance on how to strengthen Agile with Scrum. Benchmark Capability and Performance: The new performance-oriented appraisal method improves the reliability and consistency of benchmarking while reducing preparation time and lifecycle costs. Accelerate Adoption: Online platform and adoption guidance make the benefits of CMMI more rapidly achievable. Changed “Process Area” to “Practice Area”: This emphasizes that the model is not a collection of (rote) processes to be implemented, but a collection of practices to be used to run and manage projects. Organized practices within each Practice Area: Practices are organized by levels instead of Specific Goals. Levels provide a clear, methodical path for building capability and improving performance within each Practice Area. Replaced the Generic Practices with two new Practice Areas: Governance (GOV) & Implementation Infrastructure (II) to reduce the redundancy and complexity of the Generic Practices. They foster the persistence and habit of an organization’s processes and their business value rather than compliance to the model. 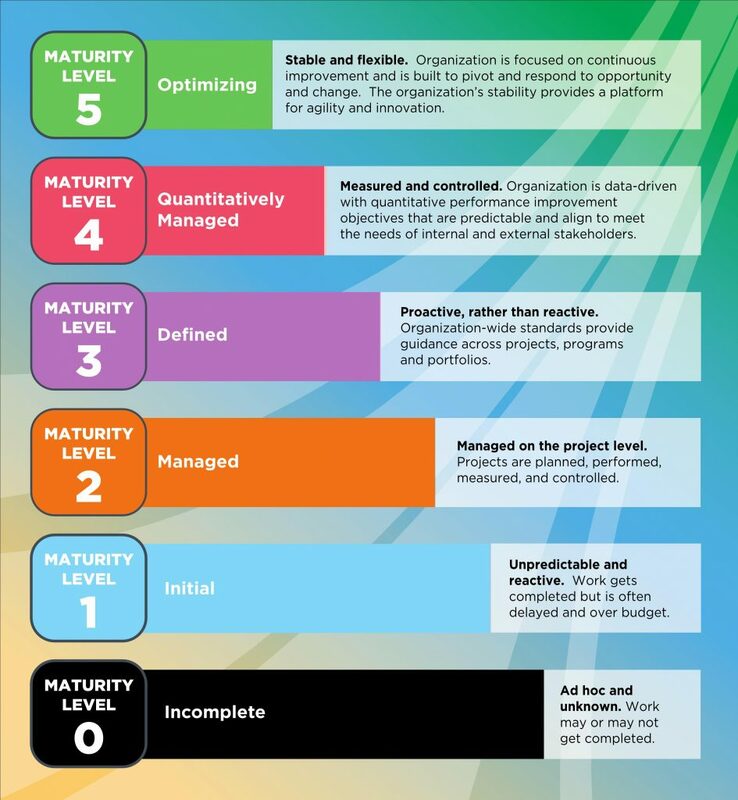 The new layout includes levels (similar to the old Capability Levels) that provide a simple process maturity pathway. For example, to be Maturity Level 3 (ML3), Practice groups at Levels 1, 2 and 3 (the “Level” columns in Figure 2) have to be satisfied. Maturity Level 2 = Green colored Practice Areas, each implemented with Level 1 and Level 2 practices. Maturity Level 3 = Maturity Level 2 + blue Practice Areas implemented with Level 1, Level 2, and Level 3 practices. Maturity Level 4 = Maturity Level 3 + dark brown CAR, PCM, SAM, MPM, PLAN, and GOV Level 4 practices. Maturity Level 5 = Maturity Level 4 + light brown CAR, and MPM Level 5 practices. Supplier Agreement Management (SAM) can be declared Not Applicable if there are no suppliers (same as CMMI V1.3). A free summary of the model (CMMI V2.0 Quick Reference Guide) is at the link cmmiinstitute.com/resources/. You will have to create an account. Below we summarize the significant practice changes in V2.0. Note that the wording of many practices has changed, and some have moved to different areas of the model. For example, if your organization is targeting Maturity Level 2, some of the old ML3 practices have now moved to ML2. We have left out Level 1 practices since they are assumed to be performed if Level 2 practices are performed. There are seven new practices and one changed practice (see change in red text). 2.1: Elicit stakeholder needs, expectations, constraints, and interfaces or connections. 2.2: Transform stakeholder needs, expectations, constraints, and interfaces or connections into prioritized customer requirements. 2.1: Develop and keep updated the approach for accomplishing the work. 2.5: Plan transition to operations and support. 2.3: Monitor the transition to operations and support. 2.1: Develop, keep updated, and follow a quality assurance approach and plan based on historical quality data. 2.4: Manage invoices submitted by the supplier according to the supplier agreements. SAM SP 1.1: Determine the type of acquisition for each product or product component to be acquired. SAM SP 1.2: Select suppliers based on an evaluation of their ability to meet the specified requirements and established criteria. For Maturity Level 3 (ML3) there are nine new practices and one new Practice Area (CAR). 3.3: Monitor the work environment to identify issues. 3.1: Develop, keep updated, and use organizational measurement and performance objectives traceable to business objectives. 3.3: Develop, keep updated, and follow a data quality process. 3.1: Select technical supplier deliverables for analysis and conduct technical reviews. 3.2: Select and monitor supplier processes and deliverables based on criteria in the supplier agreement. 2.2: Develop, buy, or reuse process assets. 3.2: Develop, record, and keep updated a process architecture that describes the structure of the organization’s processes and process assets. 3.7: Develop, keep updated, and make organizational measurement and analysis standards available for use. 3.1: Develop, keep updated, and use a description of role-based decision authority. 2.1: Select outcomes for analysis. 2.2: Analyze and address causes of outcomes. 3.1: Determine root causes of selected outcomes by following an organizational process. 3.2: Propose actions to address identified root causes. 3.3: Implement selected action proposals. 3.4: Record root cause analysis and resolution data. 3.5: Submit improvement proposals for changes proven to be effective. OPD SP 1.2: Establish and maintain descriptions of lifecycle models approved for use in the organization. OPD SP 1.7: Establish and maintain organizational rules and guidelines for the structure, formation, and operation of teams. The practices in maturity levels 4 and 5 are similar to CMMI V1.3, but they have all shifted around. Assume for now that your Lead Appraiser will explain this. The old Generic Practices have been replaced by two new Practice Areas, Implementation Infrastructure (II) and Governance (GOV). Now they are applied and appraised against your processes, rather than being appraised against each Process Area in V1.3. We will write more about these in a later article. II makes sure processes are performed, similar to the previous Generic Practices. 2.1 Provide sufficient resources, funding, and training for developing processes. 2.2 Develop and keep processes updated, and verify they are being followed. 3.1 Use organizational processes and process assets to plan, manage, and perform the work. 3.2 Evaluate the adherence to and effectiveness of the organizational processes. 3.3 Contribute process-related information or process assets to the organization. GOV makes sure that senior management actively leads the way. It replaces the more passive Generic Practice 2.10. 2.1 Senior management defines, keeps updated, and communicates organizational directives for process implementation and improvement based on organization needs and objectives. 2.2 Senior management ensures resources are provided for developing, supporting, performing, improving, and evaluating adherence to expected processes. 2.3 Senior management identifies their information needs, and uses the collected information to provide governance and oversight of effective process implementation and improvement. 2.4 Senior management holds people accountable for adhering to organization directives and achieving process implementation and improvement objectives. 3.1 Senior management ensures that measures supporting objectives throughout the organization are collected, analyzed, and used. 3.2 Senior management ensures that competencies and processes are aligned with the objectives of the organization. 4. 1 Senior management ensures that selected decisions are driven by statistical and quantitative analysis related to performance and achievement of quality and process performance objectives. There is an official mapping of practice changes between V1.3 and V2.0. 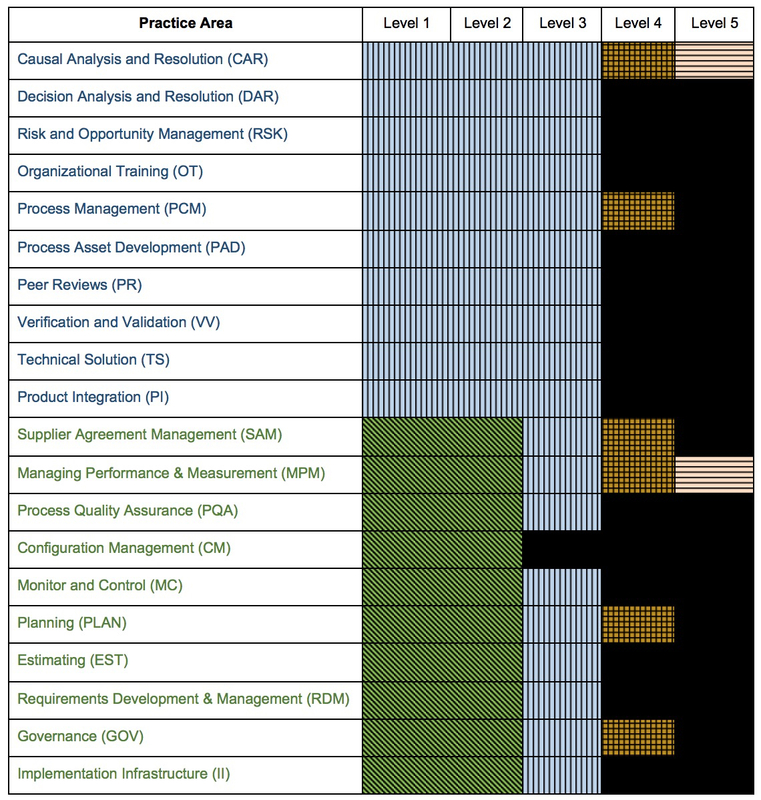 Since it is very long and hard to read, we have created a more concise mapping that we will provide to clients when we deliver upgrade or introductory CMMI training. The full model text is available for purchase in PDF or Viewer form at cmmiinstitute.com/model-viewer/. The annual Viewer license includes updates as they are published. The one-time PDF purchase does not. All the free documents listed below should be available at cmmiinstitute.com/resources. Quick Reference Guide for CMMI Development V2.0: Free. Estimation Practice Area – full sample section: Free. One-time copy of the full model (price does not cover future updates): $150. V1.3 to V2.0 mapping: Free. Online web Viewer: $250 per year. If you purchased a copy at the old $450 price, your license will be extended by 7 months. Trial Viewer access: $50 for 30 days. Three-day CMMI class student Viewer access: The Viewer price is included in the class fee and lasts 30 days. Enterprise Viewer license: Enterprise licenses are available in bundles of 10, 25, 50, 100, 150, 200, 250 or unlimited. Seat licenses can be reassigned when people leave the organization. Contact partners@cmmiinstitute.com for quotes. Adoption and Transition Guide – Free. The original licensing policy announced in March 2018 about the sharing of the model content changed in July 2018. Now, a Lead Appraiser can share a not-for-profit tool copy (e.g., spreadsheet) with a client that contains the model practices without the client needing to purchase a copy of the model. The client must purchase a license before the Lead Appraiser can give a client a copy of the models descriptive text. Benchmark: This replaces the SCAMPI V1.3 Class A (rated) appraisal. Evaluation: This replaces the SCAMPI V1.3 Class B and C (informal) appraisals. Sustainment: This is a new appraisal type that can be used to extend an organization’s rating for six years (two years at a time based on eligibility criteria). The relevant sampling factors from the previous appraisal have not significantly changed (e.g., type of work, size of organization). Note: The eligibility criteria of “In-scope projects from the prior Benchmark or Sustainment Appraisal are still active” has been deleted in the latest version of the appraisal method. The minimum organizational sample will be a random sample generated by the CMMI Institute Appraisal System (CAS). The Lead Appraiser will enter information about the organization’s projects and CAS will respond with a random sample of projects and practices. This random sample is generated a maximum of 60 days in advance of the appraisal “conduct” phase. The Lead Appraiser can (and in our opinion should) sample more than the minimum. A new performance report is required to be delivered to the sponsor and CMMI Institute for Benchmark and Sustainment appraisals. (It is optional for Evaluation appraisals.) The performance report summarizes the metrics that have improved throughout the CMMI implementation (e.g., increase schedule prediction or reduce rework). The performance report does not impact the rating. The task of generating the performance report should be started very early in the improvement cycle. The CMMI Institute has an example spreadsheet that can be used. With some clever thinking, the performance report could be the artifact used to demonstrate the Practice Area MPM. Partner-led CMMI V2.0 Upgrade Training (1-day, in-person delivery, $300/person + the LA’s labor fee). E-learning CMMI V2.0 Upgrade Training (1-day, self-paced online delivery, available starting October 2018, $600/person). High Maturity Appraisal Team Members (Levels 4 and 5) will also be required to complete the 1-day “High Maturity Concepts” course from a qualified HM Lead Appraiser at $100/person plus the LA’s labor fee. The CMMI Institute expects to develop a self-paced, e-learning format of the “High Maturity Concepts” course, but no delivery date has been established. CMMI V1.3 appraisals can be conducted until 30 September 2020 (a change from the original date of March 2020). The appraisal result will still be valid for three years. CMMI V2.0 Development appraisals can be conducted starting January 2019. The CMMI V2.0 Services and Supplier Management Practice Areas will be available 4Q2018. Service appraisals can be conducted mid-2019. The CMMI V2.0 Security Practice Area will be available 2Q2019. …then there are only a few implementation items that have changed that you will have to adopt, and many appraisal rules and regulations your LA will have to worry about. However, if your organization was implementing CMMI with no depth (:<), just barely surviving each appraisal with rote practice implementation (:<), and you had a robotic Lead Appraiser you hated (why? ), then many things have changed in V2.0 to ensure your company is focused on results (:>). Please feel to contact us if you need help improving or navigating CMMI.